The WINSmartGrid™ Technology brings together the logical components of EdgeWare, Middleware and Centralware to create a flexible Smart Grid architecture. The Edgeware is a combination of software and firmware that connects to and controls devices such as the temperature monitors, humidity RFID tags, motion detectors or X10 controllers on refrigerators. A variety of monitors/sensors are supported within WINSmartGrid™ including temperature, humidity, current, voltage, power, shock, motion, chemicals, etc. The Edgeware controls and utilizes the wireless networks that connect to the WINSmartGrid™ hub. The WINSmartGrid™ hub supports wireless protocols such as Zigbee, Bluetooth, WiFi, GPRS and RFID, however, it appears that the 802.15.4-based low-power protocols such as Zigbee appear to hold the maximum promise. Other protocols such as WiMax and Rubee are being added. The Edgeware allows the creation, setup, management, control and utilization of a two-way hierarchical and low-power network. The Middleware sits between the Edgeware and the Decision making web service or Centralware. The Middleware provides functionality such as data filtration, aggregation and messaging on the raw data from the Edgeware, extract meaningful information, and route it appropriately to the correct destination / web service. The Centralware receives real-time price feeds and other data from the utilities, has a basic set of knowledge-based rules on control decisions, and makes the control decisions that need to be executed. 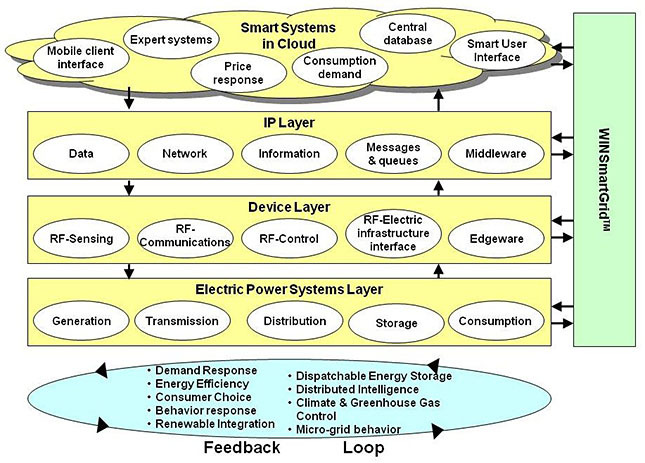 The WINSmartGrid™ Centralware also has the capability to connect to other Intelligent Web services to collaborate on decision making about the control decisions – currently it is a structural interface, with a basic set of rules only. This structural web service will eventually be connected to the external intelligent services as they come on-line. Once the Centralware makes the decisions, the Middleware is informed about the control decisions via actions, which then maps and routes these control decisions to the Edgeware, which in turn converts those decisions to low-level control signals for the appropriate controller (e.g. X10 controller connected to a Plug-In car). Plug-and-Play approach to the network installation. Reconfigurability – The capability of the technology to be reconfigurable allows OTA (over the air) upgrade of the firmware to be able to handle different and devices, applications, sensors, controllers, thermostats, etc.